HOT WHEELS CRAZY STUNT! The Best CGI I Have Ever Seen! - Muscle Cars Zone! HOT WHEELS CRAZY STUNT! The Best CGI I Have Ever Seen! How about this hot wheels crazy stunt? Many among us grew up playing around with the famous toy cars Hot Wheels. To those of you wondering, they are realistic looking little toy cars that many kids played with! They were the perfect present, a toy with limitless potential for playing and having fun! We are sure that those of you who owned a Hot Wheels car in the past can still remember which car was their favorite! A magic car that could ride on any surface, even fly and drive up a wall! Well, today we give you this video to awaken your childhood memories! 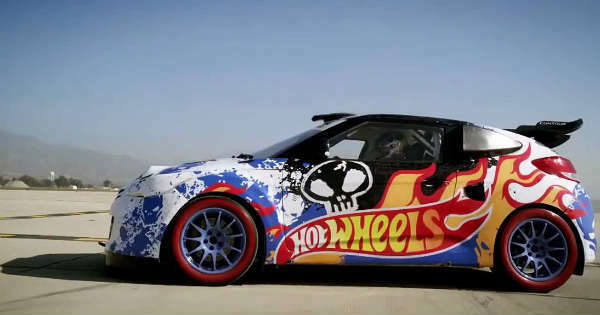 Here is an Hyundai Veloster Hot Wheels crazy stunt with a paintjob just like a classic Hot Wheels car rides up a wall! Just like the way most kids used to drive their own Hot Wheels toy cars! Who would have known that somebody would actually try to do this with an actual car! Hyundai Veloster Hot Wheels Crazy Stunt! Can This Be Real? The star of this intriguing video is a Hyundai Veloster, a compact sports car made by Hyundai, a famous South Korean car manufacturer. What makes this particularly interesting is the fact that the car is painted with a massive range of colors, just like a classic Hot Wheels toy car! To make the feeling even more genuine, they even put on a spoiler, a part found on most of the cars produced by the famous brand! The video starts with a countdown, after which the Hyundai Veloster quickly starts to accelerate. But the car is not here to show how fast it is, it is here to do something completely crazy! Its goal is to ride up a wall, and to do a U-turn while drifting vertically on the wall! Will it succeed? Will it fail? You can check out the Hyundai Veloster Hot Wheels Crazy Stunt here and see what happens! Finally, if you want to see some cool extreme sports cars photos from 2012 GENEVA Auto Show, follow this link!